I made this card for my cousin. She graduated from the University of Central Florida on May 8th. We are all so very proud of her. Way to go Morgan! I used Basic Black, Brushed Gold, and Whisper White card stock for this project. I used the Scallop Square Punch to highlight the "a" with the cap. 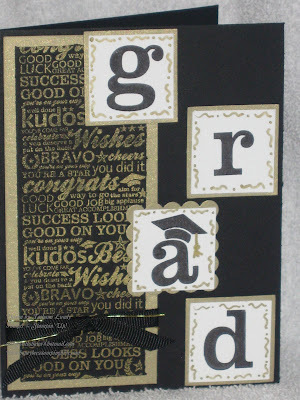 Other supplies: Gold Encore ink, Zig painty pen, black grosgrain ribbon, gold cord, 2 layering square punches.